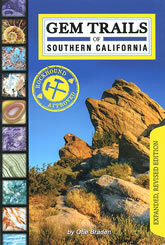 Visit the places where experienced rock and mineral collectors have found success! Detailed descriptions, photos and maps guide you to some of the best gem collecting sites in the state. This book is a 6" x 9" paperback with 208 pages. Expanded, revised edition. See table of contents below.